The thyroid gland is a small butterfly-shaped organ located on the front side of the neck, just below the Adam's apple. The gland has 2 lobes, the right and left, connected by the isthmus. The primary function of the thyroid is to regulate several important hormones in the body, some of which control the body's metabolic rate. Thyroid function can be measured by the levels of several thyroid hormones in the blood, including TSH, T3, and T4. Too much or too little of these hormones could mean that the person is suffering from a disorder of the thyroid. Disorders associated with the thyroid gland, include Hyperthyroidism, Hypothyroidism, Thyroid Nodules, Thyroid Cancer, and Goiter. If left untreated Hyperthyroidism can lead to atrial fibrillation, osteoporosis, and a life-threatening condition called thyroid storm. Memory problems, depression, or difficulty concentrating. A diet rich in vitamins, healthy fats, and proteins can control hypothyroidism to a large extent and enable a person to live a healthy life. 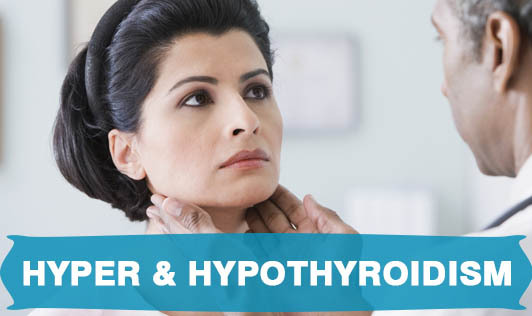 While both conditions are equally hard to manage, Hypothyroidism affects more people, a whopping 2.4% of the population. That's more than 2 out of 100 people! And women are 10 times more likely than men to develop this condition.